Vacation season is here. Millions of Americans will be hitting the highway to see our nation's great parks, camp in the mountains or swim at our wonderful beaches. Most families face a dilemma: how to fit everything in the car. Families travel with friends and pets. When there are more people, there's sure to be more luggage and gear. Young people on the go with smaller compact cars and SUVs need to haul sports gear like bikes, tents, canoes and golf clubs. 1. Car Top Carrier Bags are easy to install. Attach the straps to your rack over the carrier and you're ready to go. They fold up small when you're finished. Car top bags should be packed full so the bag material doesn't flap in the wind. The key to choosing a good bag is to consider the material it's made from. Cheap bags are made of thin material with flimsy zippers. Polyester material is UV resistant and a good choice, while nylon carriers will break down under the sun. Dual-layered material with a vinyl backing really resists the water. Good car top bags offer urethane coated zippers and liner systems as additional measures to keep water off your gear. 2. Car Top Baskets offer a sturdy structure to lift your gear off of the vehicle rooftop. Roof baskets are easy to strap cargo bags and nets to, and they offer a nice rigid base with sidewalls. A basket paired with a car top bag is a great setup offering the user much flexibility. 3. Rooftop Boxes are very easy to pack. A roof box requires a luggage rack with crossbars or a sport bar system on your vehicle. They are generally the most expensive rooftop option, and you have to consider whether or not you are going to leave it on your car all the time or store it in your garage. You'll need to pack them full or use a net inside to hold the gear in place so it doesn't rattle around. Make sure you pick a box that doesn't extend over the front windshield to catch updraft. Also remember your gear will be limited to the interior height of the box or the box won't latch shut. 5. No luggage rack? No worries! 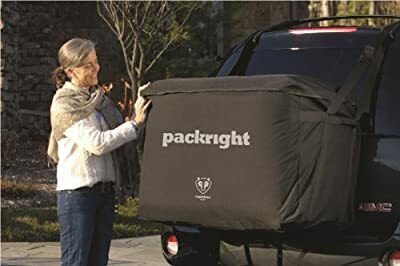 Some car top bags offer car clips that can hook on ledges on the side of your car and other car top carriers offer straps that allow you to strap through the inside of the car and over the carrier. When using a rooftop carrier, remember total vehicle height when pulling into parking garages, drive-through spots, or even your own garage at home. You are also in a good situation if your vehicle has a receiver. These are either 2- or 1¼-inch square steel mounts attached to the back of your car. You can use a receiver to mount cargo platforms, cargo boxes, bike racks and ski racks. Look for boxes and platforms with swing-out features that allow you to have access to the back of your car. Make sure to pay attention to the weight of your load and your receiver's weight rating. Once you have a carrier, ask your crew to pack gear in medium-sized soft-sided suitcases and duffel bags. They are easier to lift and arrange. You can optimize your carrier's space better with smaller bags. You can find other packing and travel tips at LakelandGear.com. David Schaefer is the owner of LakelandGear.com which designs, manufactures and sells car top carrier bags and pickup truck tents. David's an Eagle Scout and has been going on family road trips since the age of six, when his dad made a wood and canvas rooftop box to haul the family camping gear. He started the business in Silicon Valley with the original PiggyPack car top carrier and a US patent. His business and Internet operations have grown and now include the newest "invention", the Cargo Saddlebag. Currently David, his wife and two daughters live in South Carolina. They travel as much as possible testing and developing new carriers and truck tents.